Andy and Liz reside in Loveland, Ohio. Andy spends his work time as the project manager for a custom cabinet company in the Greater Cincinnati area. Liz spends her time away from home working as a Dept. Manager at a local Wal-Mart. Andy and Liz are charter members of TKO Trailriders, and Andy is an officer in The Trail Keepers Organization. Andy and Liz are currently restoring and rebuilding their home... a home that is over 100 years old. Both enjoy Xavier basketball, camping, and doing some water skiing in their Malibu Echelon skiboat. Andy drives a 2001 Ford Powerstroke, which is the local tow truck for broken down TKO rigs. 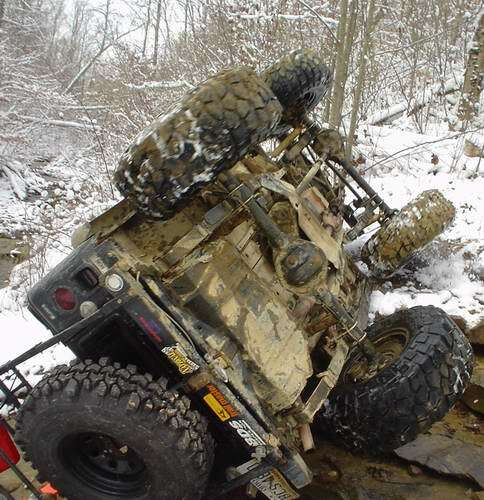 Andy has made several trips out of his way to pull other rigs home, including a trip back from Tellico where he had to pull his Jeep on the trailer, and the front tires of a Ford Bronco on the back of the trailer. This picture can be seen at the Tellico Trail Ride at the RIDES section of this website.